Stephen lit up a Patoro Churchill the other night during a poker game. I have to admit that it stank. Stank like I’ve never smelled stank before from a cigar. Wet-dog-smell stank. Ol’ Steve had put in some new Boveda packs into his coolidor, and while the packs tend to even out over about a week’s time or so, it sometime takes a while for the humidity to level out. This was a new cigar, too, and it may have been wet from the store to begin with. Either way, Stephen got me a Patoro Churchill for my birthday, as well, so I can’t wet-dog on him too much. Mine “felt” like it was at a good temperature – neither spongy and full of humidity nor dry and crisp like kindle. The Patoro Serie P is a relatively new line with Dominican fillings and bindings, but with a Brazilian wrapper. This turned out to be my first Brazilian-wrapped cigar since I smoked the CAO Brazilia Gol in 2011. Immediately, I knew that I’d gotten a Patoro in better condition than Stephen’s. The cigar lit with ease, the smoke production was immediate, with an easy and graceful draw. The first notes kicked off with chocolate, cream, and a little char. This lasted for about 20 minutes or so, and soon it turned into a mellow, low-key flavor profile. Many cigars don’t follow the rule of thirds, in which the flavor changes up over the course of the experience. While the smoke was tasty (and not reminiscent of an old, mossy children’s pool, as Stephen’s smelled), it was mellow and low-key to the point of blandness. The flavor never changed afterwards. I don’t want to down on this cigar – it required no maintenance at all and let me talk on the porch without having to pay too much attention to it. But the Patoro never really grabbed my attention in the first place. Still, a birthday cigar is a birthday cigar, and it was a perfect choice for an easy, relaxed, run-of-the-mill night. 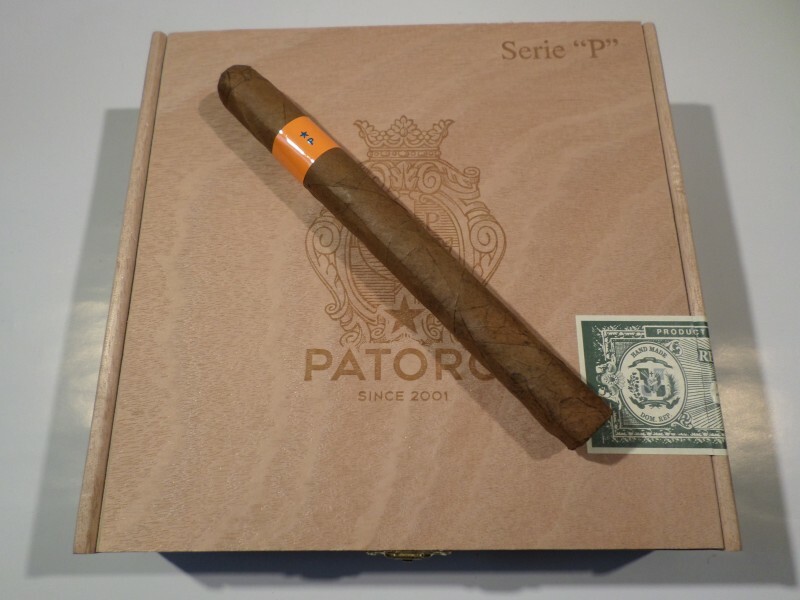 At $12 a stick, the Patoro might be a little too pricey for an everyday or regular smoke. And I can’t recommend it on a special occasion, since there are plenty of other cigars at that price point that would offer a little more variety and excitement. Still, if the box was uneven, perhaps Stephen and I both missed a delicious one. Looking forward to trying it again. The Fuente Fuente Opus X came to us all the way from the Arturo Fuente company – specifically, Chateau de la Fuente, a paradisaical-looking spot in the Dominican Republic, where workers roll the cigar leaves by hand. These Fuente workers pioneered the first Dominican wrapper leaves. And with the introduction of the first ever Dominican premium cigar – the Fuente Fuente Opus X – the company shocked the world with the cigar’s quality and deliciousness. The Fuente Fuente Opus X remains one of the most sought-after smokes in the world. These two Fuente Fuente Opus X’s have been aged for over three years, since the inception of our beloved Cigar & Whiskey community, which we began in December of 2012. And we’re celebrating in this post, y’all. Cigar and Whiskey just hit 40,000 subscribers on Facebook and we have YOU to thank. Let’s talk about the Opus X. 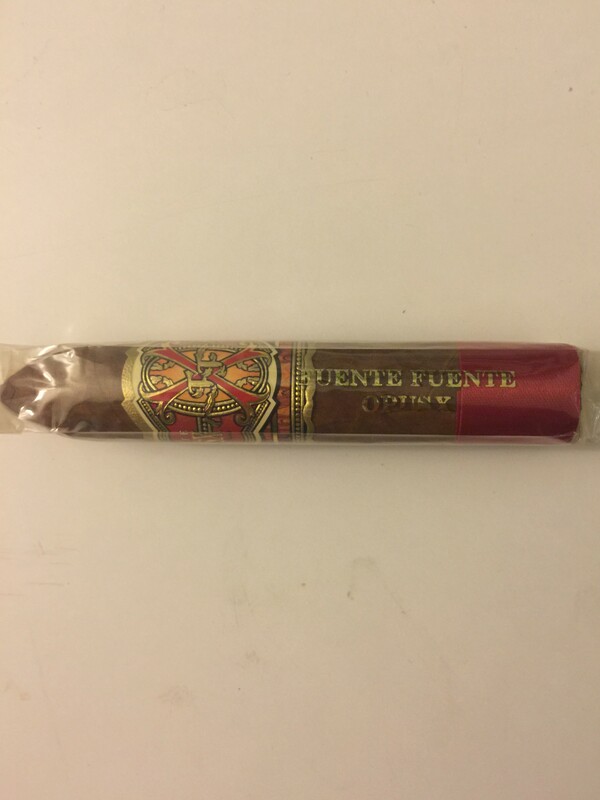 The wrapper itself indicates that the Fuente estate put a lot of care into this cigar. Rich red, accented with dimmed gold to promote a sort of family crest look, it’s a play off their standard lines of cigars, which are old standbys of C&W themselves. Mineral deposits shone around the surface of the smoke. These deposits, called “bloom,” are condensations of the tobacco oils that occur when the cigar has been left to age in optimal conditions. Stephen takes good care of his coolidor, paying close attention to the temperature (it sits in the back of his closet) and the humidity (assisted by Boveda packs). Spice! Tons of spice that floats in and out across the draw. Salt, pepper and just a hint of capsaicin or red peppers. At the very beginning of its first third, the Opus X gives off something like a very light char on a ribeye steak. It fades completely and quickly, but you’ll definitely notice it. As the night scrolled by, Steve and I began smelling wheat or something sweet that we couldn’t quite identify, wondering if it made sense to follow up such a char with something sugary. You do that all the time with a steak entrée and a dessert, so not sure why I was so skeptical. But the Opus X definitely segues into something like an old-fashioned breakfast cereal. I tasted a Honey Nut Cheerio in the wheat; Stephen picked up buttered toast with honey, another comparison I appreciated because it kept in mind the char. Like many cigars, the Opus X mellows out in the last third instead of amping up the drama. The endings of cigars have a structural similarity, when the flavor condenses, the smoke output diminishes, and the quality of the smoke deepens, becoming more syrupy. This is often my favorite part – a good nicotine buzz setting in, the night getting cooler, the conversation at a natural lull. I wrote down, “I feel like I’m being rewarded at the end of this smoke,” and I did. It was hard to put down even has the stick shortened and began burning my fingers. It’s October in Central Texas. For a good stretch of our friendship, Stephen’s introduced me to the joys of the horror genre (and subgenres), the spooky fun of Halloween, the weird intersection of the cozy fall season and sometimes sheer terror, gruesomeness, and legends. He’s also showed me one of my now-favorite short stories, “An Occurrence on Owl Creek Bridge,” a Twilight Zone-ish tale about a Civil War soldier’s execution and escape. Stephen also hosts a nightly Halloween movie special for each of the 31 days of the month. It’s a special time at Cigar & Whiskey. So, last week, we set ourselves up for a cigar/grill/porch/dog night with our good friend, Pynes, who has a Big Green Egg, a wonderful family, and two rambunctious dogs. While setting up the grill, we lit up the Tatuaje Monster Series’ Jekyll, which came out in 2014. Stephen has aged these three Jekylls since last October, and Tatuaje releases the follow up cigar, the Mr. Hyde, this year. We will review the Mr. Hyde soon and see about how it reacts and follows up with the Jekyll, but for now, let’s talk about the nicer, kinder, gentler of the two cigars/literary characters. We lit up. The first third surprised us, with a strange combination of cream and black peppercorn – almost like a potato soup. No bacon or cheese in this cigar, though. The peppercorn would transform into a spicier flavor. As we continued on, the dogs ran around and through our legs, wanting to be petted or thrown to. 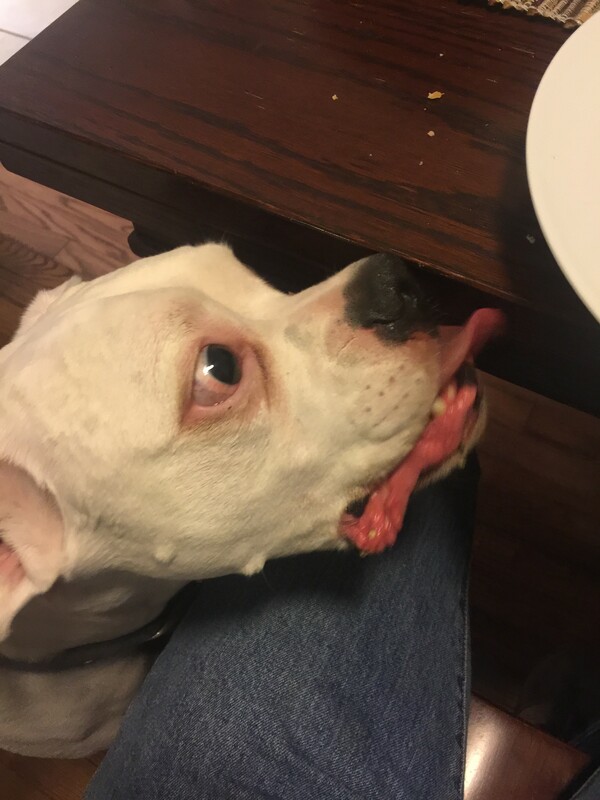 I engaged with the American Bulldog in a pretty intense fight over a rubber ball that he was pretty passionate about, and the boxer would come up, put his front legs up on the American Bulldog, and try to assist me. The cigar took a pretty good beating, and never went out. Was glad to see that it held up well. In the second third, the cream re-emerged with some light brown sugar flavors. Certainly the sweetest aspect of the flavor profile, I’m sure the cigar makers wanted to include these to indicate Dr. Jekyll’s amiable, kind personality. Smoke production stayed constant and plentiful, as you can see below. Soon, though, a coarser, leathery flavor took over, and even the spicy pepper from before melded with other flavors to become more muted. I love a hard cigar buzz, but the flavor was more powerful than the actual effects. I imagine that the Hyde will be much more powerful, potent, and unpredictable. An unusual flavor, a mercurial flavor profile, with a hint of something more powerful to come – couldn’t ask for a more enjoyable cigar in the Halloween month. Check in soon with us when we confront the Mr. Hyde – we have no idea what is in store. Stay tuned! We’re always ready for something new at Cigar and Whiskey. This week’s cigar, the Fertitta Christeaux, comes from Shreveport, Louisiana — not the first place you think of when you consider tobacco and cigar production. But it’s a humid, green and leafy state, with a vivid, tumultuous history, and citizens who make an art out of The Good Life. Why the hell not? It’s unclear where the cigar is actually rolled, though it sports fine Dominican long-leaf filler and a lovely Ecuadorian wrapper. Patrick Fertitta, the owner of the line, apparently researched dozens of cigar options before getting into the business. His diligence shows. 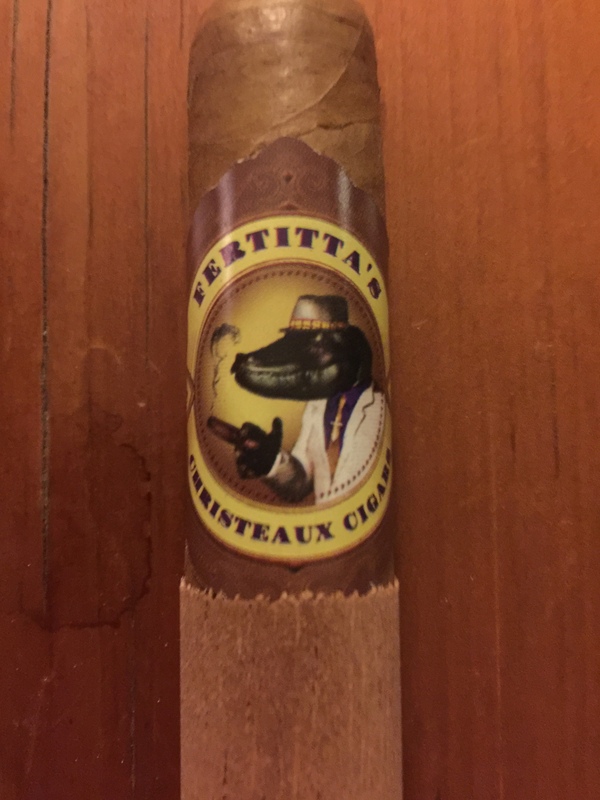 At the time of publishing, the cigar company only produces two sticks – the Christeaux Maduro and the Christeaux Natural, both toro-sized with the latter reviewed here – allowing Fertitta to start small and focus on the details. Stephen and I sat down on the Back Porch to try these out. He took the Maduro and I took the Natural, knowing that I would work my way to the Maduro later if the baseline Connecticut proved tasty. The packaging is simple, and a little old school, with an anthropomorphic alligator that is less cheesy than it sounds. The Natural had good give, and the cigars were sent to us with obvious care. The Christeaux Natural seemed aged well before I lit it, with a good, grassy smell. The first third tasted pretty damn autumnal, with plenty of grass, wheat, and some cardamom or allspice sprinkled throughout. And it became clear that both Christeauxs offered plenty of smoke, with easy draws. This seems like an obvious marker of a good cigar, but I’m always surprised when it happens — it’s a true joy when the draw stays easy and the smoke comes with no effort whatsoever. The second third grew a little more complex, introducing some cinnamon and a little sweetness with the earlier grassy-spice, but the primary flavors remained constant. So did the burn — even, slow, and easy to maintain. The final third intensified only a bit. The grass transformed into a woodsier flavor. The sweetness turned into more of a dark brown sugar. The tar around the end of the cigar collected and added a nice charred taste. For now, it is unclear on where I can purchase this line. Hopefully, the day will come soon, because this was a delightfully easy and enjoyable smoke, with no frills but also no maintenance required. I could talk at length without worrying about tending to the burn or the heat of the cigar. Be on the lookout for the purple and gold gator when it comes your way. The product excuses the fedora on the packaging. Update: You can pick one of these up directly from fertittacigars.com! Hey guys. Last week I wanted something new, so decided to visit our friends at Pipe World in Austin. Picked out the Tatuaje Verocu, a new Nicaraguan puro stick created at the My Father factory. Let’s get down to brass tacks. I started at 9:30 in the evening. The summer heat is still around here so I’d poured a huge glass of sweet iced tea. Dark brown and oily, with a good give to it, Pipe World had taken good care of this cigar and I’d been excited to take it to the porch. I toasted it carefully and lit up, enjoying some red pepper and serious heat. The intensity of the heat surprised me – along with the pepper taste, a woodsy, almost charred flavor dominated this first third. Really a hell of a one-two punch, with not a lot of subtlety in between the woodsiness and spice. Along the second third, it mellowed out a little bit, lessening its intense profile but retaining the charred, nearly mesquite taste. Despite this, the actual temperature of the smoke was not intense at all. I easily blew heavy plumes of smoke, and the draw and maintenance was quite easy. Unfortunately, though I had taken measured puffs, the Tatuaje Verocu went out just before the last third. I relit carefully, wanting to see if there was any nuance in that last bit. There may be in a less defective smoke – I doubt this is the wrapper’s fault. Could well have been a fluke. But as is usual with the tar collecting towards the last third, I didn’t perceive much taste beyond what I began with when I lit it. 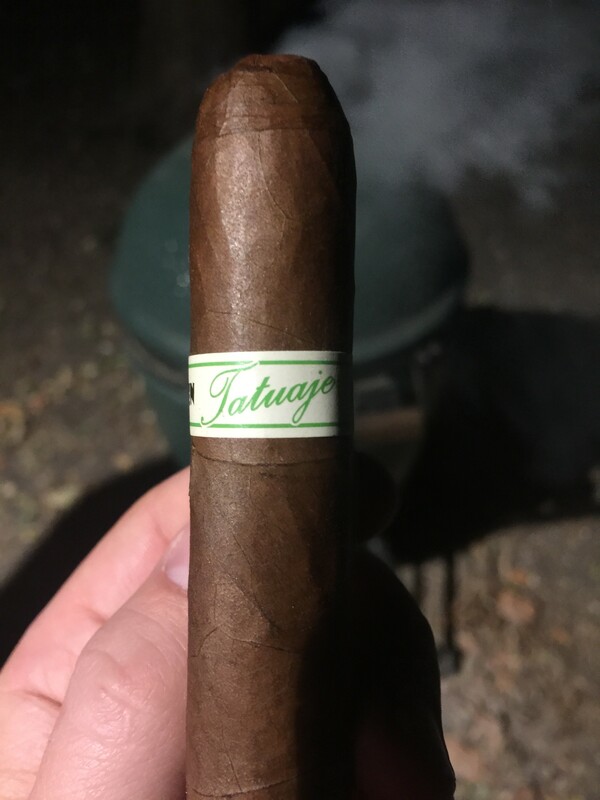 The Tatuaje Verocu is a solid smoke, but without a lot of nuance. As I mentioned earlier, it’s a firecracker cigar to begin with, mellowing out just a smidge but remaining the equivalent of a delicious campfire. Normally, the lack of variety would disappoint me, but the Verocu is so direct and intense that I did not mind. 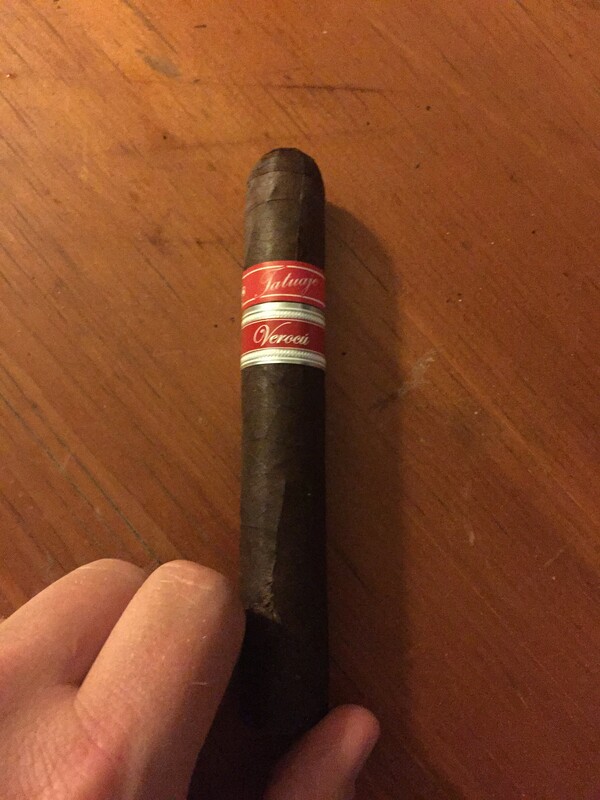 A solid smoke from a great line – especially for the price point. Pick it up if you enjoy the smell of burning leaves and fields in the fall. have at least a little quality in your product to back up what might be stellar bows and ribbons. That’s how I feel, anyway. So Crowned Heads put out this Yellow Rose of Texas line, which arrived in Texas stores only after the company put out the Tennessee Waltz and the Paniolo Especial (Hawaii). Didn’t know that the Yellow Rose was a part of a greater strategy at the time, but I doubt it would have made a difference. The Yellow Rose is both a popular song and motif in our state based (unfortunately) upon Fussball hallenschuhe a minstrel song from the 1850s. It was brought into wider acceptance after Gene Autry revised the lyrics and transformed it into a cowboy campfire song in the 1930s. The song is playing during Rock Hudson’s diner fight in “Giant,” and Elvis famously covered it in “Viva Las Vegas.” It was a touchstone of LBJ’s vice presidential campaign in 1960, and it’s one of those songs that every Texas kid probably sings at at least one point in his basketball trikots günstig or her life. Point being, there is a strong history behind the Yellow Rose of Texas. 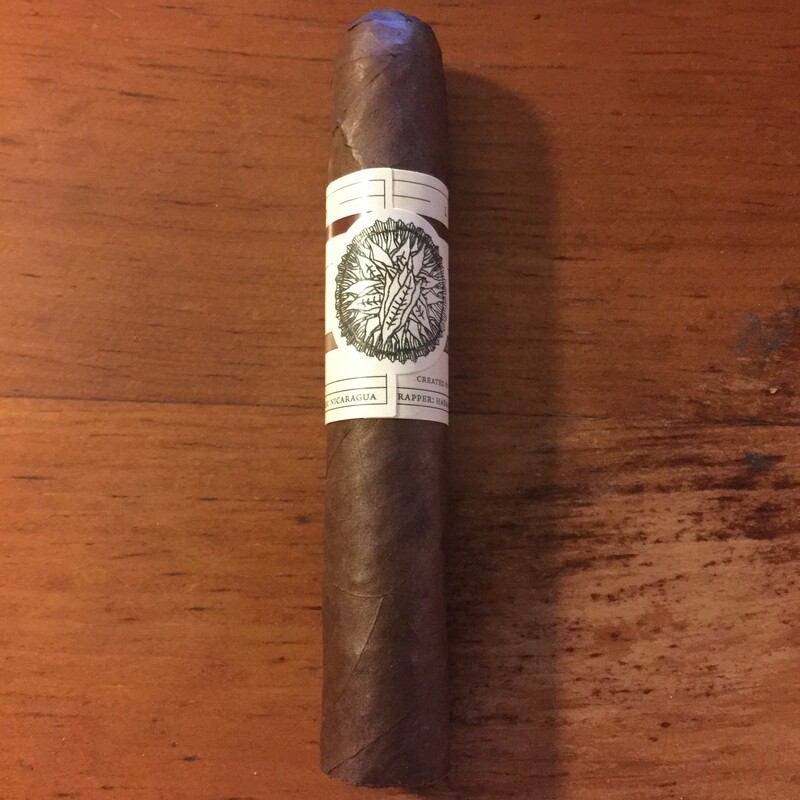 Did this Crowned Heads line live up to the legacy? I’ll be honest and won’t B.S. you. 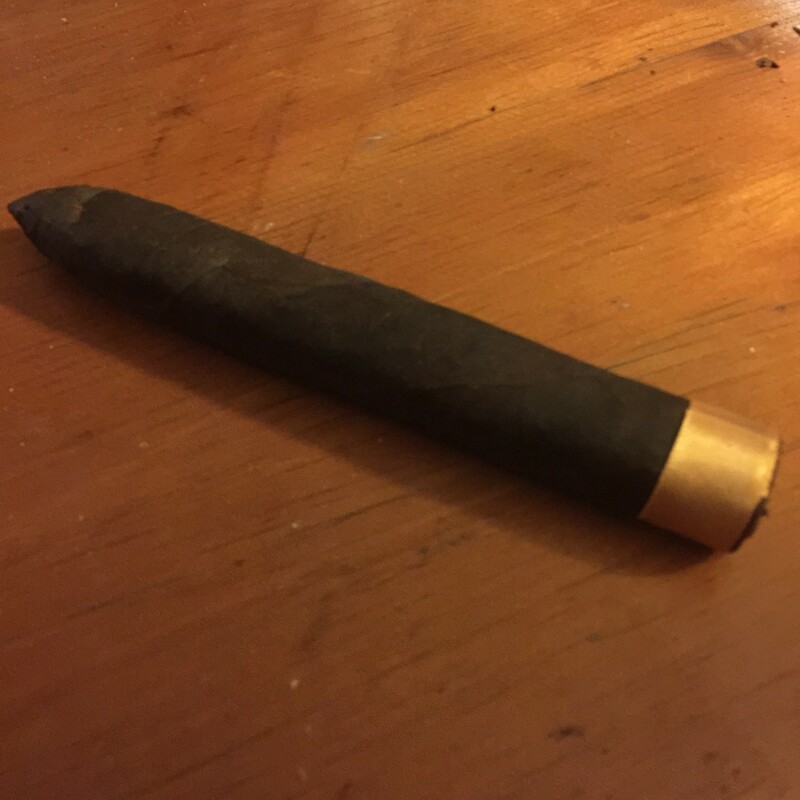 I smoked this cigar a month and a half ago, took no notes, confident that the experience would leave its own mark upon my memory. I can’t remember much at all. I know that the wrapper was dark and promising; the band itself was a simple yellow ribbon, charming in its simplicity. I wondered if Crowned Heads drew upon some kind of influences or traditions regarding the kind of cigars original Texans smoked (the wrapper is a Connecticut broadleaf, with the filler and fussball trikots kaufen binders Nicaraguan.) The stick only comes in torpedo form, and the tapered end tends to lead to fraying, which I remember well. Maintenance was a pain. But the flavor? Whether it changed, tasted smoky, rich, flat or stale? Did it engage me, pull me in, affect my senses? Was there even a decent buzz? Did it taste, somehow, like Texas? I just couldn’t tell you. But I am $10 shorter a month and a half later. I haven’t smoked a CAO in a long, long time. The brand used to remind me of my days at the humidor back in 2011, when the CAO Brazilia Gol! boxes sold heavily and the company seemed to double down on its sporty, vibrant image. Usually, I’m more attracted to the classics, and I’m a sucker for good packaging. The CAO Pilon (“pillar”) has that classic vibe. The name itself suggests stability through the ages, and the packaging features an Old World font and vibe. I sat down with the Pilon several weeks ago, and can’t wait to continue smoking these as we move into the fall. I smoked the 5 x 52, or the Robusto, which came in a habano Ecuadorian wrapper, encasing Nicaraguan binder and filler leaves. The first third contained some real sweet hay flavors with a little bit of cedar and allspice. It’s a perfect autumnal flavor. I don’t want to smoke a candle, but the flavors made for a light, aromatic, and relaxed smoke. After about fifteen minutes, the basketball trøye NBA second third transformed into smokier spice, more powerful and bolder than what was hinted at in the beginning. The sweet, light hay also turned darker, resulting in a thicker, syrup sort of flavor that tasted a little like applejack or maple. This is how I imagine a cigar geek’s version of a pumpkin spice latte, even though there’s nothing that sweet in this smoke. The final third of the cigar ended up being the darkest, as usually happens. The syrup from earlier developed into a strong maple flavor, and the sweetness was juxtaposed with very prominent spice. The entire stick smoked evenly with absolutely no maintenance needed. Even when it burned hot, it was so enjoyable that I smoked it until the end. My only complaint with the Pilon was that it smoked a little tight – no Gandalf-level smoke production here. But that could have simply been the luxus uhren replica treatment of the cigar beforehand – the Pilon probably just needed a bit more drying out. Looking forward to this CAO being a good go-to for the fall season. Let us know your favorite fall cigars. I paired this Pilon with a Dr. Pepper Ten, but we are looking forward to autumnal whiskey tastings soon as well. Enjoy! 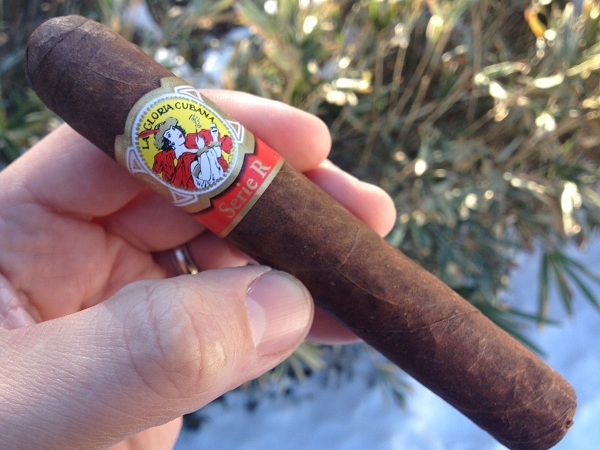 Earlier this week, a friend brought over some cigars and handed me La Gloria Cubana Serie R No. 5, the Natural version as opposed to the Maduro. Venturing back into the smoky world of cigars, he talked about how he used to smoke them as for their reliability and excellence. He did not oversell the experience. It’s Fourth of July weekend, and my guess is that you’re looking for something tried, true, and with no fuss. You need reliability, but it’s a party, so you want something that goedkope voetbalshirts kopen packs a little more potency than usual. And if you’re bringing several cigars for friends and family, you don’t want to break your piggy bank. The Serie R No. 5 is about $6.50-7.50 well spent. In production since 1999, La Gloria Cubana Serie R earns a solid reputation as being full-flavored without being overpowering, a workhorse of a cigar with flashes of bold and spicy flavor. The Natural has an Ecuadoran wrapper, and is stuffed with Dominican and Nicaraguan filler. It’s a good mix, but maybe my taste buds are burnt or on vacation already – to me, this was quite a sweet cigar. I toasted the foot of the smoke and started off with great bitter chocolate flavors, like cocoa powder straight from the Hershey’s tub. Smoke output started slowly but consistently. I have a tendency to smoke cigars quickly and goedkope voetbalshirts they often grow hot, minimizing flavor; I slowed down and tried to focus more on the first third. Soon the bitterness moved into sweeter milk chocolate flavors. The smoke became more prevalent and plumes soon filled my entire back porch. With the last third, the sweetness of the La Gloria Cubana Serie R receded and settled down into earthier, woodsy effects and flavors. It did require a little bit of tending than earlier, but I found it worth the effort. I was happy to take part in my friend’s tradition and have already committed to making it my own.